Was Einem Heimat War. Photographs by Peter Granser. Published by Bücher & Hefte Verlag, 2012. Bücher & Hefte Verlag, 2012. Hardbound. 80 pp., illustrated throughout, 6-3/4x9-1/2". The title of Peter Granser's newest book derives from that letter, written in 1937 by the Bürgermeister of a village in southern Germany. Translated (context-free by reverso.net) as "what was to a homeland" the phrase pulses at the heart of Mayor Schilling's valedictory epitaph for his town, which was being co-opted by the German army in order to expand its military training grounds. The rolling, open, agricultural landscape of Gruorn was tailor-made for infantry and artillery practice; despite vocal resistance, the villagers were removed, displaced, wiped off of the ground they had worked and sustained themselves from for generations. Was Einem Heimat War, by Peter Granser. Published by Bücher & Hefte Verlag, 2012. Clinging to—the instinctive, relentless attachment one has to place and person, to person as place and vice versa. Think, parents, of a child who doesn't want to be set down on the ground, in a bed, or a relative stranger's arms. What Granser describes in his modest book is this dative, transitive idiom of action upon or attachment to an object, and what remains in the wake of those actions. I wondered, and asked the photographer if he had a specific tie to this place. His black-and-white views of the landscape have a denatured feel to them, as though the land itself has had all the color squeezed out of it and any photographic emulsion would record it accurately in monotone. 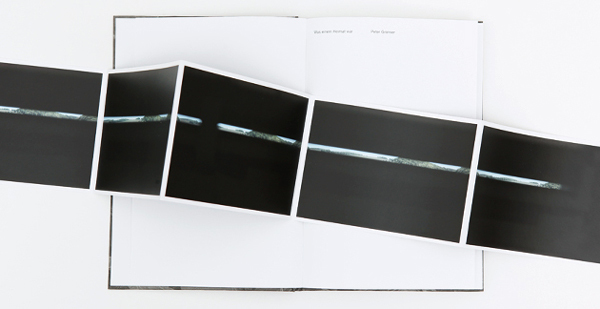 Elsewhere Granser has titled these photographs of the Gruorn landscape Spuren—traces. Ironically, through counterpoint and collage his book seems to imply that all of the leached-out color has been absorbed into some oddly appealing though very deadly traces of the land's military past that would rudely interrupt a nostalgic wandering through the uprooted town. Since 2005 the landscape has been a biosphere reserve and a transformation of the landscape is slowly taking place. A lot of rare species (fauna and flora) can be found, but the area is still contaminated with projectiles and unexploded ordnance and only some paths are open to the public. One could imagine looking down at one's feet and spotting these lethal, left-behind blooms amidst their grey surroundings. Granser's modus operandi in photographing the projectiles has more than a shade of Becher-ian typology, and perhaps a hint of Avedon's In the American West white-backgrounded catalogue of the exotic and unknowable. Yet the objects remain largely inscrutable, simultaneously mute and threatening, entrancing and repulsive as their violent intentions become apparent. Inserted into the book is an accordion-folded pamphlet, illustrated with two panoramas. "Panorama II" offers that eyes-down view, what a sapper on his knees might see in the process of unearthing mines, though no blooms blast into view (fortunately). On the recto of this piece, "Panorama I" is a powerful hint about Granser's black-and-white landscapes, which in the book have an eye-level, pedestrian quality to them, as though someone were strolling through the ruins of a town, trying to triangulate familiar paths by feeling the topography, recreating what little rhythms there may have been between one sensed place and another. (Look up spatial mnemonics and the method of loci for related physical/psychological phenomena.) In "Panorama I" a horizontal slit across five panels of black ground reveals the rolling horizon line, in color. Though Granser doesn't state it overtly, this view could best be construed as that of a German Panzerkampfwagen commander, anticipating enemy approaches during tank maneuvers in the late 1930s. Tank as time machine. Granser, a 2011 winner of the Talent Art Prize from the Helmut-Kraft-Stiftung zur Förderung der bildenden Kunst, has completed five books prior to Was einem Heimat war on a variety of topics in what one might expediently label a "traditional" vein of reportage. Peter Granser 2000–2007 (Super Labo, 2011) surveys his images of distinctive places like Sun City and Coney Island and his interests in Elvis, cowboys, and signs (the last being the subject of SIGNS, a monograph released by Hatje Cantz in conjunction with the 2008 exhibition This Land is Your Land at the Museum of Contemporary Photography, Columbia College, Chicago). In my work I am always interested in identity and the loss of it. In my newer projects (j'ai perdu ma tête that will be published by Kodoji in early 2013 and "Heaven in Clouds," a series I worked on between 2009 and 2012 in China) I am, beside identity, very much interested in "home" and its disappearance. This connects my three newest projects. Some people are a bit confused looking at my older work and now at Was einem Heimat war. I took a break in 2008 and started to develop my work further. For some time I have been interested in video and sound; I have started to combine these with my photographs for exhibitions. Installation of my work has become much more important. I try to find the right approach to translating a theme. GEORGE SLADE, a longtime contributor to photo-eye, is a photography writer, curator, historian and consultant based in Minneapolis, Minnesota. He can be found on-line at http://rephotographica-slade.blogspot.com.